It took three years to come up with a plan to raise aircraft which ultimately involved divers attaching lifting equipment to what was believed to be the strongest parts of it’s frame and then raising it whole in one single lift. Originally, the plan called for building an aluminum frame or cradle around the wreck, but those plans were abandoned after it became clear it would take too long cost more than the £600,000 project budget to do so. 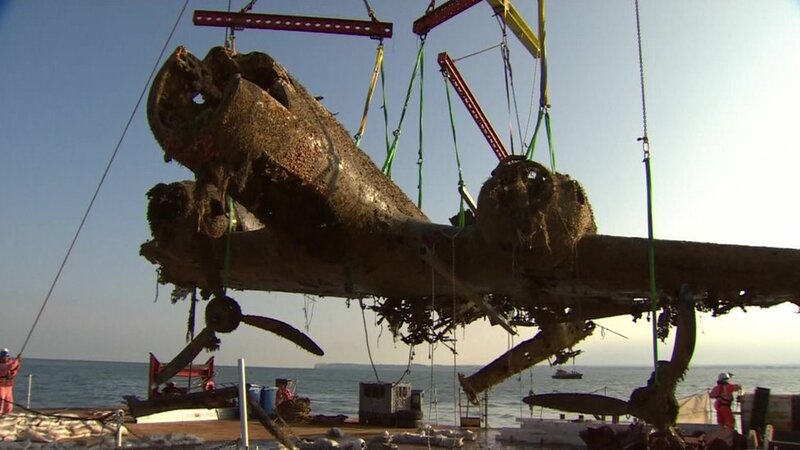 The Dornier Do-17 aircraft is believed to be the only intact example of its kind in the world and has lain in 50 feet (15 meters) of water on the Goodwin Sands. However, the aircraft will still need a two-year restoration at the RAF Museum’s site in Cosford, Shropshire. To learn more about the Dornier Do-17, check out a cool BBC interactive by clicking here along with an album of pictures showing what’s left of the aircraft. No single “f***” in the whole conversation. Compare it to modern soldiers in Iraq. So might the Chinese be trying to send a subtle message to the West or one country in particular here?!!! The competition was held at the Omaka Airport by the Marlborough Aero Club on Saturday February 2, 2013, with 55 pilots from around the country competing in 4 weight class categories. Scores were counted as the total of shortest distance for takeoff and for a full stop landing over two circuits. An all-metal Zenith ZMX won the light sport category averaging just 18 metres to get airborne. The Zenith STOL is considered to be the ultimate light sport utility kit plane as its often called the Sky Jeep and its available in DIY kit form from Zenith Aircraft Company. Thought you might be interested to see what we do here in New Zealand and if there is any way to learn from you guys and perhaps link in if one of your bush pilots happens to be heading our way it would be great to meet them. Likewise and if there are any pilots in the UK who might be interested in a STOL competition, check out the page dedicated to this year’s competition on the Marlborough Aero Club’s website along with a special Facebook page as I suspect it might become an annual event. The Daily Mail has a rather bizarre story about a whopper swan in Jersey who lost his mate a few years ago and has fallen in love with a £6million Eurocopter EC155. Even more strange is the fact that although dozens of different choppers fly in and out of the runway every week, the whooper only has eyes for the EC155. He even recognizes the chopper’s engines when it flies in, chases it down the runway and then sits and nestles by it until the chopper’s owner flies off again! Since the pilot and local airport officials were afraid the swan would fly into the chopper’s rotor blades, they decided to have a vet clip his wings. And while there are many swans in the area, there aren’t any other whooper swans. ‘He seems very happy but I would like to find him a female white swan – but this is Jersey and there aren’t many around. So if you know of a lonely female whooper swan in need of a mate, please contact the Jersey Airport or the nearby Les Mielles Golf and Country Club before his wing feathers grow back and this love affair ends in tragedy! Twenty year old Californian Jack Wiegand’s quest to become the youngest person to fly around the world solo recently hit a problem: He forgot his passport. Even worst, Jack only noticed not having his passport when he arrived at his first international destination, the remote town of Iqaluit, Canada, located northeast of Hudson Bay. Luckily, Jack remembered making photo copies of his passport and visa documents the night before his hometown of Fresno, California, and he told his mom to check the copy machine. Luckily for him, it was still face down against the glass. According to Jack’s blog, his flying adventures began on his 13th birthday when he piloted his first introductory glider and then on his 14th birthday, he became the youngest pilot in the Central California Soaring Club to solo a glider. At aged 16, Jack soloed his first single-engine power plane and now he intends to break the Guinness World Records™ title by becoming the youngest person to fly solo around the world with the trip being paid for by donations which will also benefit two non-profit organizations, Big Brothers Big Sisters and International Agri-center Ag Warriors. Jack is actually scheduled to arrive in London today and then its on to Rome on Monday with his final arrival back in Fresno scheduled for June 8th.